The year 5773 draws to a close, and as is customary in companies and organizations at the end of the year, Ezer Mizion sums up everything that was done in all its divisions and prays for a better year in all respects. At Ezer Mizion, the year 5773 was characterized by significant expansion in all areas of help and assistance under the organization’s command. All this is thanks to Ezer Mizion’s dear partners, who gave the organization the ability and the strength to press forward in their work. Ezer Mizion is now entering the thirty-fourth year of its activities. Each and every year had a unique momentum all its own. The uniqueness of the year 5773 is in the expansion and growth it has seen in all areas and in the ability to provide a response for huge numbers of requests in each and every department. More and more families of patients require the enveloping services that Ezer Mizion provides. More and more families of the elderly, debilitated and Alzheimer’s patients need our counsel and assistance. 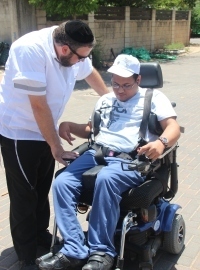 More and more families of special needs children need Ezer Mizion’s helping hand and professional guidance. Ezer Mizion makes a tremendous effort to respond positively to as many requests as possible and to help more and more people. “All along the way, we felt the sense of unity and collaboration of our “partners.” We remembered that without them, we would be compelled to turn away vital applications for help,” the organization’s administrators say. We went to have a look at the many areas in which Ezer Mizion lent a helping hand over the last year. We returned full of myriad impressions and profound amazement, but due to the shortage of space, we present to you only a tiny part, a small sampling that serves to attest to the rest. Over the past year, hundreds of families suddenly found themselves coping with a family member with cancer. The grueling treatments, the critical decisions, the lengthy hospitalizations, the side effects, the fear and the worry, all these affect both the patient and his surrounding family. But Ezer Mizion envelops the patients and their families in a cushion of daily assistance that enables them to get through this difficult period. Ezer Mizion’s ambulance fleet numbers some 20 ambulances. In the year 5773 alone, these ambulances responsibly and professionally transported 73,053 ill and disabled individuals who have no other means of mobility. Bone Marrow Registry – the Privilege to Save a Life! More than 674,000 tissue-typed blood samples comprise the International Bone Marrow Donor Registry, which provides a unique response for Jewish patients. For many of these patients, this is their only avenue to recover from fatal illnesses. Over the past few years, the Bone Marrow Registry saved the lives of more than 1,330 Jews in Israel and abroad. The Registry is located in Oranit, the hostel for cancer patients, and is part of the comprehensive system of assistance that Ezer Mizion runs on behalf of Jewish cancer patients in Israel and abroad. 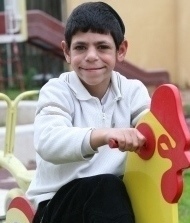 Thousands of special needs children make progress each month in the framework of Ezer Mizion’s Children’s Division’s therapy and support programs. Thanks to the dedicated care provided by the professional staff, the children enjoy a sunny present and an even brighter future. Among the Division’s activities: Afternoon activity clubs, retreats, day nurseries, Hakalah Respite Project, personal shadows, game lending library, Active Nurturing Playground, Information and Counseling Center and more. The Counseling Division, under the direction of Rabbi Shimon Rogoway, combines in-depth, up-to-date knowledge with rich experience. The hundreds of callers each day receive a clear, comprehensive response, referral to the right doctors in Israel and around the world, along with assistance in checking out their insurance framework. 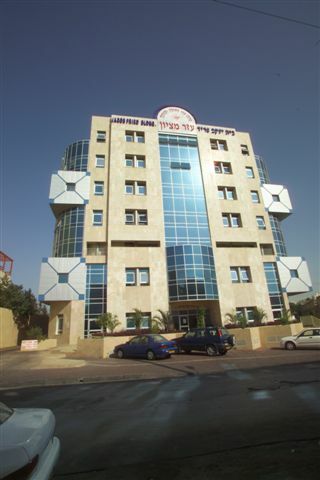 The Center helps people struggling with mental illness and their family members through a variety of unique programs and referral to the appropriate professionals, alongside a “Mental Health First-Aid Station.” Among the mental rehabilitation services provided by Ezer Mizion: Rehabilitative occupation, Mentors Project, Coaches Project, Family Counseling and Support Center. The Center provides a broad range of social services to eligible families in the community, among them: Assistance in running the household, coaches for the family, personal shadows for special needs children, mentors for children who are ill, disabled, or in foster care. The Center provides hydrotherapy sessions, sport therapy, and physical therapy, exercise groups, and wet and dry rehabilitation sessions. The activity at the Center improves the client’s functional capabilities and upgrades the quality of life for the disabled, elderly, ill, and special needs populations. Thousands of seniors enjoy warm, respectful attention at the rich and diverse activities adapted to their age and needs, alongside physical and emotional support and professional home attendant services that enable them to age with dignity. More than 650,000 hot meals, sandwiches, and baked goods are distributed each year in hospitals and to homes in which a family member is ill or hospitalized. The food services are provided through the National Center and the local branches of Ezer Mizion across the country. The hot, fresh food gives recipients the strength and hope to continue the battle. At Ezer Mizion, more than 14,000 people volunteer in many different areas of chessed, including: Assistance in hospitals, transport of the ill and disabled, cooking hot meals, babysitting for and helping special children, assisting the elderly, support for the mentally ill, and more. Thousands of units of costly, sophisticated medical equipment are loaned at no cost each day at Ezer Mizion’s Medical Equipment Lending Centers. These accessories ease the suffering of the ill, disabled, and elderly, and give them hope for a better tomorrow. And that’s not all. We can fill pages and pages with descriptions of all the good work being done at Ezer Mizion. We could write endlessly of the good deeds that are done with the 180 NIS of the Partnership. But even the partners themselves understand that we can only present a taste, a few drops from the ocean. The year 5773 is receding into the horizon, packing up its days. The Day of Judgment approaches and tens of thousands of merits gather to the defense of the Ezer Mizion Partners at the moment of truth. All of Ezer Mizion’s merits – are yours.